The Deeper team at the Consumer Electronics Show. 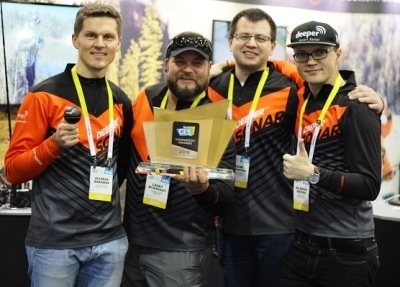 At this year's prestigious US Consumer Electronics Show (CES 2016) in Las Vegas, 6-9 January 2016, the Lithuanian company Deeper UAB won the CES 2016 best wireless innovation award for their Deeper Fishfinder. 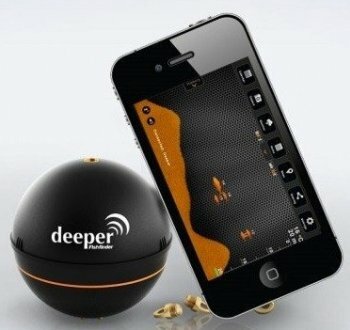 The Deeper Fishfinder is a fishing device to detect underwater fish with sonar. The device, in appearance like a small ball, when submerged detects fish with sonar and then relays by wireless to the fisherman's smartphone the location of fish and their depth in real time. Prior to winning the prestigious CES award, Deeper had already won international accolades and the fish finder has become a commercial success. In Australia in 2015 the Australian Fishing Tackle Trade Show chose the Deeper Fishfinder as the Best Fishing/Boating Accessory of the Year. It even made the news on Australia's ABC TV on its 7 o'clock news about a week ago. It is already available in about 40 fishing gear stores in Australia. Deeper is an example of the success that Lithuania's exporters have been achieving. The Deeper company exports 96% of its products outside Lithuania.